I think this is the first game to end with the PC giving a speech. I have a friend who thinks he's funny. When you take him out for a meal, and later ask him how it was, he'll often say, "It satisfied its core mission of providing base nutrients to my organs and fending off starvation." This is his obnoxious way of saying that it wasn't very good. If he played The Keys to Maramon, I suspect he'd say, "it satisfied its core mission of preventing me from being unamused for about five hours." It did for me, anyway. I spent most of those hours waiting for a delayed flight in an airport, so I'm not ungrateful, but I don't think my life will be any different now that I've finished it. The game is excruciatingly linear. You encounter monsters in a multi-level dungeon. The various parts of the dungeon are separated by doors requiring various types of keys; you find the key to the next area just as you finish killing all the monsters in the previous area. A few monsters require special weapons to kill; you find those weapons just before encountering those monsters. Eventually, you reach the final encounter and the game is over. There really isn't a single role-playing choice--or even much of a character-development choice--along the way. Finding the final key to Maramon. 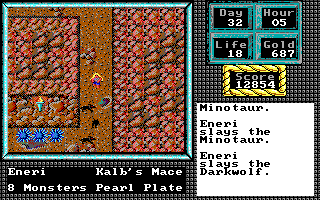 As I covered in the first post, the core quest of the game is to save the denizens of Maramon from the monsters that keep swarming out of the city's towers at night. Monsters appear every night at 20:00, and you want to try to kill them all before the morning, leaving dungeon exploration and character development for the daytime. For a while, I was afraid of the consequences if I didn't return to the city at 20:00 to deal with the latest assault, but eventually it took so long to get to the last-explored dungeon level and back that I stopped going back to the town. It didn't seem to have any consequences. Occasionally, I could anticipate what tower they would emerge from, and just kill them as they came out. Otherwise, I had to chase them around town all night. 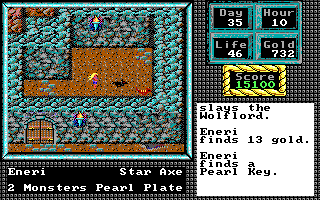 The monsters progressed in difficulty throughout the game, using the same creatures introduced in The Magic Candle: orcs, goblins, wolvingas, gnolls, trolls, barges, fermigons, zorlims, darkwolves, and so forth. Towards the end of the game, the most difficult creatures were packs of darkwolves and "tigrets," often led by someone called a "wolflord" who invariably had the next key. The RPG elements were weak and provided little challenge. Every 1,000 experience points, I could level up and choose to increase one of my attributes by one point, but this only happened 15 times throughout the game against a collective base attribute total of 135. Thus, my character only improved by 11% throughout the game. I'm reasonably sure that you could win the game without ever leveling up. The NPCs had little of value to contribute. 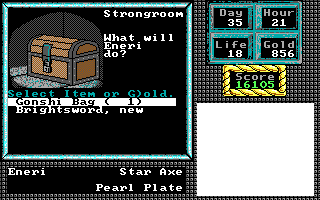 The weapon shop and armor shop provided a few upgrades throughout the game, but these were quickly overshadowed by special weapons and armor found in the dungeon (which mercifully never break). Fortunately, I found a Brightsword moments before needing it. Combat remained a blunt, SPACE bar-mashing process throughout. The only "tactics" were in the use of the environment to avoid letting enemies attack from multiple sides. Dropped gold also served this purpose--for whatever reason, enemies won't walk on it. There was also some minor strategy associated with when to use missile weapons and wands, both of which were too expensive to rely on exclusively. Melee combat remained absurdly deadly: even average enemies are capable of killing even the best-armored character in a few seconds, especially if the character is accidentally facing the wrong direction. Mushrooms mitigate this danger, and before particularly difficult combats, I would load up on nifts, migrets, luffins, and gonshis. These are so plentiful throughout the game that I never had to buy any from the herbalist. I thought the numbers were how many she had in stock, but they turn out to be how many you're purchasing at a time. Late in the game, I started finding more "potion jars," which instantly heal the character to full hit points. Once I had read all of the rare books in the library and stopped having to save money for that, I used that money to load up on these potions. When I first went to buy them and saw that the price was 50 gold pieces, I thought this was expensive but fair. Then I discovered that the 50 GP charge includes eight of them. This is absurdly cheap for what they do, and I ended the game with dozens of them still in my inventory. The ability to instantly regenerate all hit points for $6.25 makes the late game far too easy. 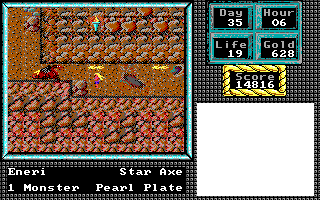 The end of the game featured a series of quasi-bosses, starting with "Bazards," requiring Kalb's Mace to kill, then followed by dragons, requiring the "Star Axe" to kill. Again, both weapons were found in storage rooms immediately preceding these encounters. A dragon breathes fire at me as I charge him with the Star Axe. The library had given me the impression that the final encounter would be with an evil wizard, and that I'd need a "Brightsword" to defeat him. Reading the tome about wizards actually damaged my character, leaving him with only one hit point and permanently reducing his hit point total by one. Eneri finds the ultimate weapon, which I never actually got to use. Eneri has found the lair of the evil wizard Alvirex! Eneri recognizes Alvirex from a picture in the book in the library! Eneri remembers when bargs and gnolls were her biggest worries. She gathers her courage. She demands: "What is the meaning of this!!" "Ahh! The hero!" says Alvirex. "Eneri, is it not? I must congratulate you. You have been quite annoying. Shortly, however, you will cease to be a problem." "I am delighted that the Hero of Maramon takes an interest in my work," says Alvirex. (Eneri detects a subtle hint of sarcasm.) "I have come to Maramon to experiment with . . . you might call them portable teleportals. With them, I have brought the minions of Darkness to Maramon from all over the continent of Gurtex." Eneri is furious. "You have treated Maramon as your playpen and its people as your toys!" "I have no time for childish oratory," sneers Alvirex. Eneri can wait no more. She must destroy this monster of monsters! Eneri crashes into an invisible energy shield! Even her Brightsword cannot penetrate the shield. Alvirex lifts his staff. A ball of dark energy speeds towards Eneri! Eneri raises her Brightsword. The ball of energy flows into the blade of the magic weapon. The sword blazes bright. Alvirex scowls. "We seem to have reached a standoff. Perhaps you should leave." Eneri refuses. "Perhaps we can settle our dispute another way," says Alvirex. "What say you to a foot race? Name the distance." For a moment, I thought the game really was going to end with a foot race. That would have been a unique, if stupid, RPG ending. Eneri is tempted. She has never met her match in such a contest. She would have jumped at the challenge a month ago. Yet Eneri has learned something in Maramon. Humility? Maybe. Caution? Surely. Wisdom? Who knows? The air beyond Alvirex begins to shimmer. "My studies here are complete," says Alvirex. Alvirex turns. As he steps through the shimmering portal, Alvirex lifts his staff. The walls shake. Alvirex vanishes! As Eneri leaves the chamber, the waters of the Sea of Oshmar pour into the cave! What follows is a sequence in which I had to flee the caverns across the tops of rocks as they flooded with water. I'm not sure if there was a time limit to the thing, but if so, I got out in time. It's about time NPCs started treating me like this. I reached the surface to meet cheering townsfolk. 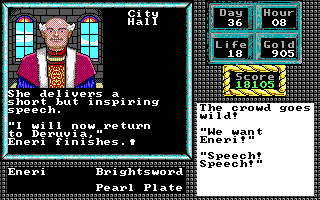 After a quick parade through the streets, Mayor Andello gave me a set of blue pearls and the key to the city. I delivered a "short but inspiring" speech, concluding with me trying to decide whether to return to Deruvia or "travel onward to Castle Oshcrun and Gurtex." 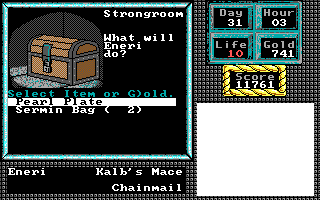 The game concludes by letting me save Eneri for use in The Magic Candle II. The footrace thing was a bit weird, and I was slightly disappointed that the final confrontation didn't involve any actual playing or decision-making, but overall not a terrible ending. 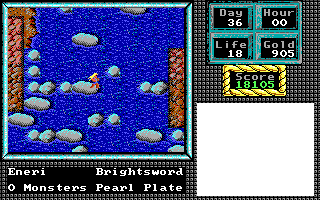 It suggests that the entire game is something of a prologue to The Magic Candle II. I have a feeling we'll run into Alvirex again, and perhaps even his teleportals. 4 points for the game world. In this, I'm not giving it credit for the overall Magic Candle universe, but it's little piece of the game world is still reasonably-well outlined, and the back story fits well with the gameplay. The "pay to study" system was an interesting, if ultimately unnecessary, way of introducing the game's lore. 3 points for character creation and development. Creation offers only two options: class and name. Leveling up is a matter of studying a tome in the library, which raises a chosen statistic by one and your hit point total by two. Neither really has the effect of making you feel stronger or more capable. 3 points for NPCs. The game offers them but makes them mostly inconsequential. Most of them hang out in the two taverns, and every day you can talk with a different selection of them, but most of what they tell you is either obvious or red herrings. 4 points for encounters. Enemies come in three varieties: those that hit, those that hit harder, and those that shoot things. The dynamic by which they swarm the city at night--forcing you to track them down and wipe them out--is reasonably original. Theoretically, you could grind against them indefinitely, postponing visits to the dungeon, but the nightly attacks get old after a while. There really aren't any other puzzles and special encounters in the game. 2 points for magic and combat. Combat is a bunch of action RPG key-mashing, and there isn't any magic aside from magic wands. Taking on a bunch of darkwolves. 5 points for equipment. The character can have one type of armor at any given time but can carry a large number of melee weapons, ranged weapons, and wands. There's nothing special here, but just as with The Magic Candle, I give the game credit for creative use of mushrooms to increase abilities. The game also deserves some credit for the "fire globe" mines. "Pearl plate" was the best armor in the game. Maramon has a thing with pearls. 5 points for economy. With money needed for studying, buying weapons and armor, buying and recharging wands, buying arrows, fixing weapons, and (theoretically) buying mushrooms, gold has value through most of the game, and you don't find very much of it. Only towards the end of the game does the character get too rich. Considering that a new longsword only costs 50 gold, I think I'm going to pass. 3 points for quests. The main quest is clear, and the nightly attacks form something of a "side quest." There are no choices or alternate outcomes, and the endgame is a little lame. 4 points for graphics, sound, and interface. I found the graphics and sound tolerable--nothing particularly creative, nor anything particularly bad. The keyboard interface mostly worked, but I found the directional keys unresponsive in the worst place: combat. The game is incapable of registering more than one key at a time, so you cannot effectively turn while also hitting the SPACE bar to swing your weapon, and it takes more discipline than I have to calmly stop swinging in the middle of combat, pause, turn to face a specific enemy, and start swinging again. 3 points for gameplay. Not very challenging and extremely linear, the primary virtue of the game is that it doesn't drag on. I guess you could consider it mildly replayable in that the different classes face slightly different levels of difficulty. I suspect a scholar faces the most difficult game, as his primary strength is in the use of magic wands, and they cost quite a bit to recharge. This gives us a total of 36, just on the cusp of what I call "recommended." It certainly doesn't hurt to play it for the few hours that it takes to win, and when you're done, you have a character for use in The Magic Candle II. But like Hillsfar--another game weirdly sandwiched between bigger titles--it's not really worthy of its franchise. 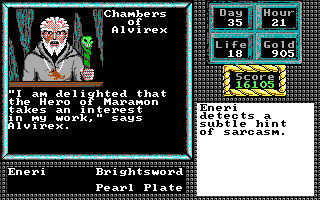 In the September 1990 Computer Gaming World, Alan Emrich praises Maramon specifically for its simplicity and brevity and seems to like all of its mechanics. However, he also notes that he is not an RPG fan in general ("I am not Scorpia," he says), and he admits that "some might consider [Maramon] a cheese puff when they really wanted a steak." I'm fine with an occasional cheese puff, but I don't think Maramon works particularly well even as that. MobyGames's round up of reviews finds mostly middling ratings, with even the easily-impressed Dragon giving it only 3 out of 5 stars. At best, the game serves up a preview of themes to come in The Magic Candle II, and I look forward to playing this true sequel next year. 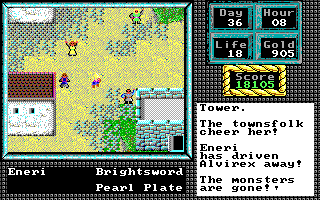 Next up, we'll be toggling Captive with Ultima: Escape from Mt. Drash. 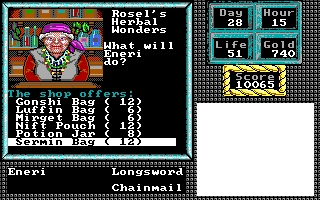 Maybe it was meant as a gateway drug to CRPGs in general, or just to The Magic Candle II. Maybe it was made for children? The score "feels" surprisingly high. By the way, the game has the second-highest GIMLET score/hours played ratio (7.2), just behind Crown of Arthain (7.5). Wouldn't a low GIMLET score/hours played ratio be harder to achieve? I don't think there's any way to make the statistic useful. If I really liked the game, the number of hours is a good thing; if I didn't, it's bad. Yeah, the statistic could go either way. But the opposite would be a low-scoring game that is hard to finish or very repetitive, hence the long playtime. Knights of Legend has a ratio below 0.5, for example (Dragonflight is also clearly below 1). The worst "offender" is NetHack, of course, which is meant to be extremely hard, sort of a rite de passage, and the ratio is around 0.2. On the other hand, one might play enjoyable games longer, to test the engine or to go through all possible storylines. So the playtime would be relatively long. But then the GIMLET score would also be higher. In a way, it's more a concern for developers - "Does the game justify the effort I put in it?" 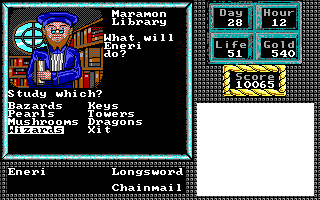 Keys of Maramon is a really "meaty" game considering that it only takes these 5 hours to finish it. That's why I thought that the score was surprisingly high. By the way, I guess that the perfect GIMLET score/hours played ratio in the context of this blog is 1. I personally don't find it appropriate to have the score divided over the hours. See, if I'm playing a game with a GIMLET score of 5 for 10 hours, I'm subjecting myself to its crappiness 5 every single second of those 10 miserable hours. And if I'm playing a game with a GIMLET score of 80 for 30 hours, I'm enjoying its full 80 points every second as well - over an orgasmic 30 hour period. As you often do, Kenny, you have spoken the truth ... in a discomfitingly gross way. Thanks, sort of. Are you ASchultz - the quthor of the Magic Candle walkthrough?? What an honor! I had no idea bloodstone was part of the magic candle series. I remember it being enjoyable but broken. You can work for money in real time. When I played it on my Pentium 100, the speed of my CPU meant that I could amass more gold than I needed for the entire game by walking away from the computer and playing Magic: The Gathering with my brother for an hour. I guess you could do that in The Magic Candle, too, but the time limit keeps you honest. I've loved Bloodstone for about twenty years; I'd say that it's the best entry in a great series, and I still play it every year or so. That said, the economy is so broken, especially in the early part of the game (not to mention the terrible interface for shuffling money and inventory around the party), that I never bothered to make my PCs do an honest day's work. I'd burn money on all kinds of training, even vocational/occupational, just because it was there and I had too much gold. And this is despite making every last party member max out not only in blade and bow, but in magic too (which costs a lot); what's more, I equip EVERY caster with ALL the spell totems -- the most expensive items in the game, and well worth it. By the way, characters with low Loyalty stats will quickly get restless, working for the man every night and day. If you assign one to be a wage slave for a game-year while you march off with the rest of your party, don't be surprised if you come back to find that your gold farmer has packed up and gone home -- possibly across the continent, or on some island. Party-splitting in Bloodstone was an artifact held over from The Magic Candle 1, but it was totally useless by 4 (or 0). There's no simultaneous lever-pulling, no mindstones to enable concurrent questing, no real benefits from assigning tasks, no hard time limit, nada. Quite a shame. It's not the only aspect in which Mindcraft failed to follow through with something potentially good in Bloodstone, but I still think that the game's good qualities make up for the bad ones. I liked this one, it was a short read. After looking back and reading posts of some of the longer games, it's nice to read about a short one. Siege is a good game for its time, though I think DOSBox had some issues with it last time I tried playing it. The game's engine would be updated for Walls of Rome, an arguably better game. Ambush at Sorinor is pretty disappointing though. The premise is interesting enough: You're a mercenary captain who has to hire forces to win a variety of scenarios for (I think) four different races. But the AI is so mind-numbingly poor that you'd notice that the enemy units move along a pre-determined path in each scenario. Once you figure out the path, it is trivial to mine the way with traps and eliminate everyone. Pretty comical cover art though. A bit more topical: These 'sandwich' games would likely have been DLC of the preceding game in today's business environment. Whether that's a positive or a negative is a personal opinion I suppose. And another commenter spoils the a game, Ambush at Sorinor. chet isn't going to play siege or ambush so what does it matter? After your description of the game I really expected lower ratings in almost all categories. Is it just me or have you given earlier games of comparable economy/encounter/quest fewer points. A main quest exists, but calling the attacks side quest is already stretching it. With how much less can you get away? As always, great read! Just wondering about consistency. I don't know. I wrote the GIMLET while I was in the middle of a seminar and my attention was distracted. It's possible I rated a category or two a point higher than normal. The overall rating feels okay, though. I think the footrace thing may have been a reference to your character's background occupation of courier. The text is probably different for each of the four characters. That does make sense. It's still a bit weird. It didn't look like it would be that guy's forte, and I was surprised he brought it up. If anyone else plays the game with other characters, I'm curious what the text says for them. I've played the game with a blacksmith and Alvirex offered me an arm wrestling contest. The blacksmith was tempted but declined just like the courier. I think it was an obvious trap so I would have declined too given the choice. Interesting. That guy doesn't really look like he'd excel at arm wrestling, either. He probably trains himself in QFG. "but I don't think my life will be any different now that I've finished it." How many of the games you've played as part of this blog have had such an impact? Questron II and Ultima IV come to mind immediately. Maybe also the Baldur's Gate series and Morrowind, but that's a speculation. Oh, I missed "as part of this blog". Well then, it's probably zero, except maybe Rogue (in that it set the blog rolling). Of course, "it didn't change my life" is just a nice way of saying "It left no impression on me." I think I need to hear how Questron II changed your life. I was speaking for you on that one. Feel free to take over. Unless you're joking, I assume you're referring to the original Questron, which was the first RPG I ever played. That did indeed change my life. Questron II was a joke that I played for a few hours in 2011. Yeah, I meant Questron I. Oops. If I were going to crack a joke like that, I'd pick Faery Tale Adventure or Don't Go Alone or Braminar. Yeah, it just didn't really capture the same magic. The premise seems reasonably neat with a subpar execution; I can envision a game that plays this research/city defender/dungeon exploration a lot tighter being really fun. If they'd just made combat SLIGHTLY more interesting, it would have been a solid game. Agreed. If K2M had featured the series' usual customizability in character skill improvement (blade/bow/magic/stealth/etc. ), it could've gone somewhere. And also, seriously, "TURNS OR GTFO". The library offered tomes (at 200 gold pieces per reading) on the major challenges in the dungeon, indicating that I'd need "Kalb's Mace" to kill demons called "Bazards," a "Star Axe" to slay dragons, and a "Brightsword" to defeat an evil magician--all of which were somewhat unnecessary to read, as these weapon upgrades all occurred immediately before the enemies that I needed to kill with them. It would have been impossible to miss them. I think Chet missed something vital here. When I played the game I couldn't find any of these items unless I read the appropriate tome. I absolutely did. I didn't realize those items wouldn't show up unless I'd read the appropriate passages. Thanks. I've made an edit above. 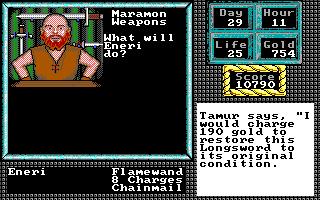 From what I recall, if you're transferring from The Magic Candle 1, your Hero will suffer a huge hit to his stats whereas a Hero/Heroine from The Keys To Maramon will have the same stats. Probably because the Hero from TMC has the opportunity for greater growth. At least, in-game, the reasoning was that the Hero from KTM was just fresh off from his/her adventures unlike TMC Hero who had a few good years of engagement in heroic debauchery. I'll probably use the KtM hero. Giauz stopped commenting on my blog months ago; no need to perpetuate his memory. * MC1: Lukas saves Deruvia from Dreax. 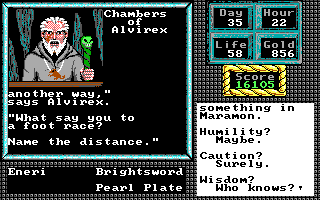 * K2M: Some random volunteer (with this or that day job) saves Maramon from Alvirex. * MC2/3: Lukas goes back to dealing with Deruvia's latest problems ... except that you find out that Lukas might be secretly female (Luka) and was concealing it until now. Oh yeah, and Luka(s) is also the K2M character (if you played it), because he has the pearl armor, but not the super-sword Brennix (if you imported your game from K2M instead). If you imported from MC1, none of this happened; "it was all a dream!" i'm surprised no one mentioned eneri being irene backwards!! Keys seem like a boring game - thanks for playing it for us! I wonder whether you could upload the savegame for import into MC2? I played MC2 years ago and feel like playing it again after reading your blog. I didn't know the hero could be hired from the Inn?! You can and I did! Check out my MC2 review.